Farnham and Burlington: Ashgate 2012. xix+312pp. Farnham and Burlington: Ashgate 2012. xiii+266pp. Farnham and Burlington: Ashgate 2012. xiii+239pp. Kierkegaard’s relation to the field of philosophy is a particularly complex and disputed one. He rejected the model of philosophical inquiry that was mainstream in his day and was careful to have his pseudonymous authors repeatedly disassociate themselves from philosophy. But although it seems clear that Kierkegaard never regarded himself as a philosopher, nonetheless there can be no doubt that his writings contain philosophical ideas. Many later thinkers have used his works as a source of insights and ideas that they could apply in the context of their own philosophical program. As a result, his thought has been profoundly influential in a number of different philosophical traditions. The present volume attempts to document these different traditions of the philosophical reception of Kierkegaard’s thought. The articles featured here aim to demonstrate the vast reach of Kierkegaard’s writings in philosophical contexts that were often quite different from his own. 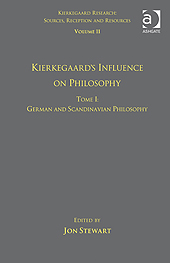 Tome I is dedicated to exploring the reception of Kierkegaard in Germanophone and Scandinavian philosophy. As is the case in theology, his influence in philosophy is particularly strong in the German-speaking world. Kierkegaard has been a major influence for such different philosophical projects as phenomenology, hermeneutics, dialogical thinking, critical theory, Marxism, logical positivism and ordinary language philosophy. Similarly, in Denmark and Norway, Kierkegaard’s writings have been more or less constantly discussed by important philosophers, despite the later dominance of analytic philosophy in these countries. The present volume features articles on the leading Germanophone and Scandinavian philosophers influenced by Kierkegaard’s thought. "...when one marvels at the scope of this series as a whole, it becomes clear that this tome fits into a broader collection which approaches the subject of Kierkegaard from about as balanced and diverse a perspective as one might expect to find, making it an invaluable resource." Mark Daniel Safstrom, German Studies Review, vol. 36, no. 1, 2013, pp. 191-193. 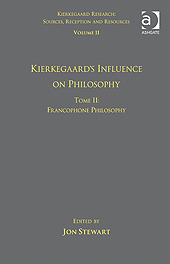 Tome II is dedicated to exploring Kierkegaard’s influence on Francophone philosophy. The French intellectual tradition squares well with Kierkegaard’s eclectic profile since its leading figures are often difficult to classify unambiguously as philosophers, theologians, literary critics or simply writers. Kierkegaard’s thinking was influential for many generations of French philosophers right up to this very day. Ever since the discovery of Kierkegaard in the Francophone world, he has remained a fixed pillar in French philosophy. He has been influential in the context of most every modern school of French thought: phenomenology, feminism, structuralism, post-structuralism, semiotics, and deconstruction. "This collection of essays belongs to the ‘reception’ section of Jon Stewart’s vast editorial project, Kierkegaard Research: Sources, Reception and Resources....This book, the second tome of volume 11, Kierkegaard’s Influence on Philosophy, provides an extremely useful starting-point for exploring the diverse responses to Kierkegaard’s texts and ideas in twentieth-century French thought." Clare Carlisle, H-France Review, vol. 13, no. 168, 2013, pp. 1-3. "A brilliant example of scholarship, this well-referenced collection will appeal to specialists." Yolande Aline Helm, French Review, vol. 88, no. 2, October 2014, p. 251. 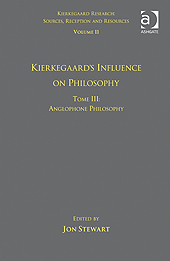 Tome III traces Kierkegaard’s influence on Anglophone philosophy. It has long been thought that Kierkegaard played no role in this tradition, which for years was dominated by analytic philosophy. In this environment it was common to dismiss Kierkegaard along with the then current European philosophers who were influenced by him. However, a closer look reveals that in fact there were several thinkers in the US, Canada and Great Britain who were inspired by Kierkegaard even during the heyday of analytic philosophy. Leading Anglophone philosophers read Kierkegaard and made at least some limited use of him. The situation today is much different. It can be said that Kierkegaard has made some serious inroads into mainstream Anglophone philosophy, and many authors are today seeking inspiration in his works for current discussions concerning ethics, personal identity, philosophy of religion, and philosophical anthropology.